Each day we have been greeted by the cows mooing and the beautiful sunshine; this morning was no different. After breakfast we traveled literally over the river and through the woods to grandma’s house. Our team had the privilege of spending time in the humble home of Martha and David (Esther’s parents). Over hot chai, homemade chocolate doughnuts, carrot cake and zucchini bread David willingly told us about some of the history that his country and tribe have gone through as well as some of the gruesome acts on both sides of the battle line in the fight for independence. Also at their home Esther talked about coming back to the states with Isaac and her girls and how she felt racism from both African Americans and whites. Through her addressing the problem head on, Esther got to be friends with a woman who at the beginning displayed so much hate toward her and her family. Because of both David and Esther sharing we are getting glimpses into their stories and seeing how important communication is. From there we traveled up the road to two widowed women’s homes. 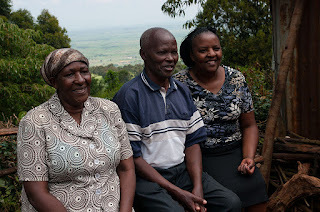 We listened to them tell Esther their story in Kikuyu. After they were done conversing, Esther translated their stories. Then we had the opportunity to pray with them for their individual needs. We left them with flour and sugar as a gift and thank you for welcoming us to their homes. As we were leaving the final home we had a decent walk to get back to the Daraja House, and I had the privilege to walk with Martha and hear pieces of her own story. She has arthritis in her knees so walking uphill both ways (seriously) is a struggle, but that meant that I had more time just with her. Martha is 64 and has six children and 11 grandchildren. She loves irio (a concoction of mashed potatoes, corn and green leaves) and she has the sweetest spirit. Now we not only have a Kenyan mom, but also a grandma, or shosho as they say here. Our team had some time to relax today, and I gratefully took full advantage of that on the roof of the Daraja house. The past ten days, as you have been reading, have been packed full of meetings, praying and just being with people in general. As weird as it might sound, being with people all of the time is absolutely exhausting. Tomorrow we travel to a new town, Kisumu, to go on an adventure. This is an adventure because we are not entirely sure what all we are doing or where exactly where we going. Don’t worry parents, we are in safe hands! Fingers crossed and prayers said. We are unsure if we will have internet connection, but no news is good news in this situation! I am currently writing in the dark as I complete this post. Poor Sadie and Becca were in the shower when the power completely shut off. Thankfully we have a few flashlights to lead us up the stairs and to our beds. When in Kenya . . .